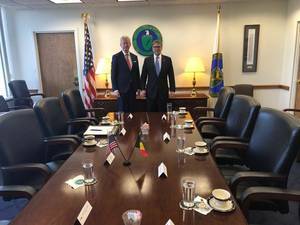 This week, the Minister of Home Affairs and Security, Pieter De Crem, paid a bilateral working visit to the United States. In Washington D.C., Minister De Crem had several discussions on homeland security, border control and data exchange for the purpose of managing and restricting illegal trafficking, in particular weapons and drug trafficking. The Federal Bureau of Investigation (FBI) shed light on the funding of criminal organizations, on the aspect of cybercrime as well as on the specific issue of Syrian fighters (Foreign Terrorist Fighters). The emphasis was on the exceptionally good relations between the US and Belgium as both countries share a strong common vision and action plan in the crucial area of data exchange and in dealing with the underlying causes. During an in-depth and fruitful meeting with Secretary of State Rick Perry, the focus was not only on the economic ties with our country – particularly the relations with Houston with regard to energy and the port of Antwerp as world-class clusters in the field of petrochemical industry – but also on the global production and supply constraints of both our countries and of Europe as well. This discussion was held for obvious reasons of security and stability. As the supervisory authority of the Federal Agency for Nuclear Control (FANC), Minister De Crem and Under Secretary for Nuclear Security Lisa Gordon-Hagerty made concrete arrangements to further the joint development of implementing MYRRHA-technology in its cutting-edge technological and scientific areas of application. This was followed by discussions with Congressman Mike Rogers from Alabama and Senator Ron Johnson from Wisconsin on all the above-mentioned topics. An entire working session at Lockheed Martin was spent on the roll-out of the F35 program and its economic impact on the Belgian business sector. At the United Nations in New York, Minister Pieter De Crem first addressed the assembly – and in the presence of Mrs. Amina Mohammed, Deputy Secretary-General of the UN, and Mr. Joao Vale de Almeida, EU ambassador to the UN, inaugurated the photographic exhibition of the Spanish-Belgian Ximena Echague, which had previously been on display in the European Parliament. Minister De Crem called for a balanced policy in terms of security and migration. As a non-permanent member of the Security Council for the next two years, our country will be able to play a unique role in this matter, given our alternating presidency as of February 2020. Finally, Assistant Secretary-General Alexandre Zouev thanked our country for its important participation to the PKO – the Peace Keeping Organization. Minister De Crem also ensured an increased and gender-balanced participation of the Belgian Federal Police.